WELL DONE ALL! CONGRATS MASTER SONIC! 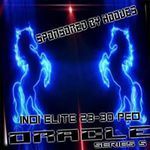 If you would link to join Oracle Indi Elite Series here is the link - www.facebook.com/groups/230439633814384/ please remember that all players need VIP to be able to access the rented room.